The stack of football magazines at Topps don’t lie. 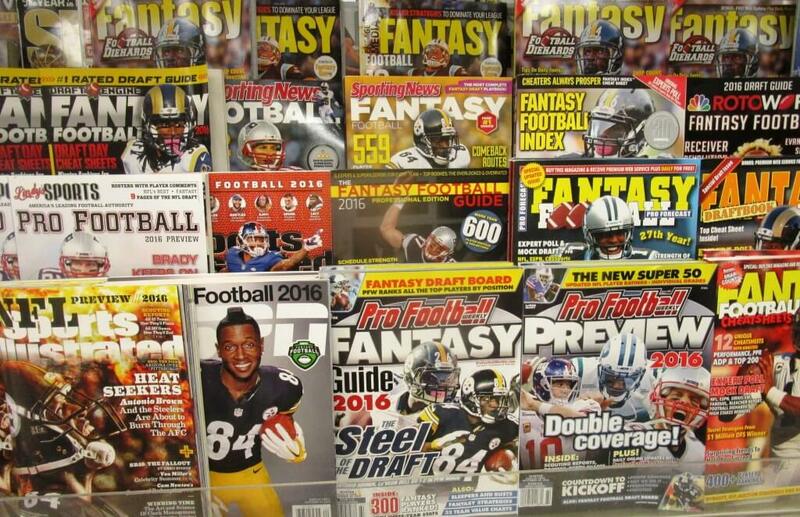 The magazine aisle at Topps is print heaven for fantasy football fans. Expert advice on draft sleepers and the subtleties of reading injury reports. Some of the magazines offer full season team predictions. And the old news is that the Bill are headed for mediocrity. According to the The Sporting News, Sports Illustrated and Pro Football Weekly, the Bills will be 8 – 8. Yesterday’s loss to the Raven offered the first week of evidence. Remember, gambling men who only want the truth read these magazines. For the 17th consecutive season the Bills will miss the playoffs. And, disappointingly, this will be the third straight season the Buffalo Jills will sidelined from the sidelines. Three years ago, a still ongoing lawsuit led to the disbanding of the cheerleading unit. It is unclear when, if ever, the Jills will return. We’ve written extensively on the jilted Jills. 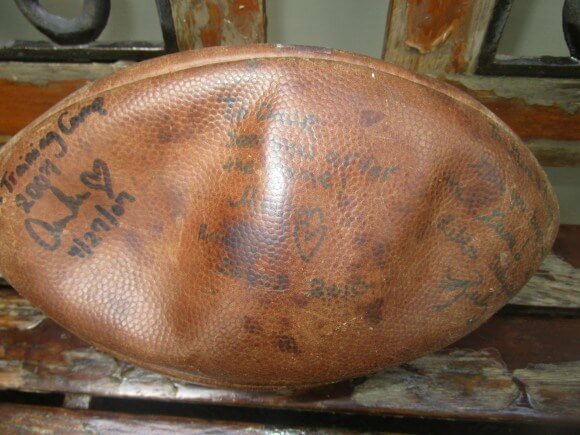 It began with Vivid memories of the Super Bowl run and a football, Jack, signed over the years by many Jills. “Four Falls of Buffalo” and still jilted by the Jills and Love has found a way! Buffalo Jills coming to the Otter led to former Jills visiting the Otter Lodge in Brighton for a meet and greet with Jills and Bills fans. The hiatus of the Jills is particularly sad when we reflect upon how short-lived are most cheerleading careers. On the one hand, the public is clearly recognizing that cheerleading is a sport. Division 1 schools now offer cheerleaders athletic scholarships. People are increasingly appreciating the athletic and artistic talents of cheerleaders, as well as the dedication it takes to hone their skills, practice after practice. On the other hand — as explained by Jean and Nancy — after college there are few opportunities for cheerleaders, only in indoor lacrosse and football leagues. Probably only a handful of Division 1 coaches actually make their living from cheerleading. Ultimately for Jills, cheerleading in the NFL is like making Broadway. Their moment to show to the world abilities worked on since high school. Their deserved center stage. And the Jills’ loss is our loss. With the new season underway, I know Jean and Nancy — and all Jills Nation — are sorely missing their sisterhood performing artistic and athletic feats. 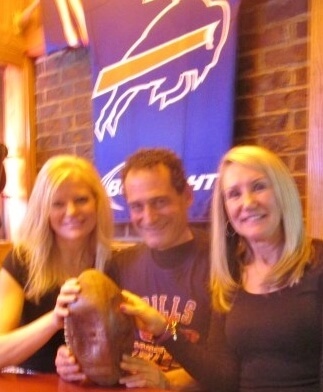 To gauge how Bills Nation feels about the jilted Jills, I spoke with Gregg Salina, owner of the The Wintonaire, one of the most popular “Bills Bars” around town. When I was there an hour or so after the loss yesterday to the Ravens, there were plenty of blue jerseys taking solace in beer and chicken wings. As for the Jills, Gregg said he hears less and less talk about their absence. And the longer the Jills are off the field, the more they will fade from memory. Gregg offered some insights into the situation. It’s not that people don’t like the Jills, Gregg said. 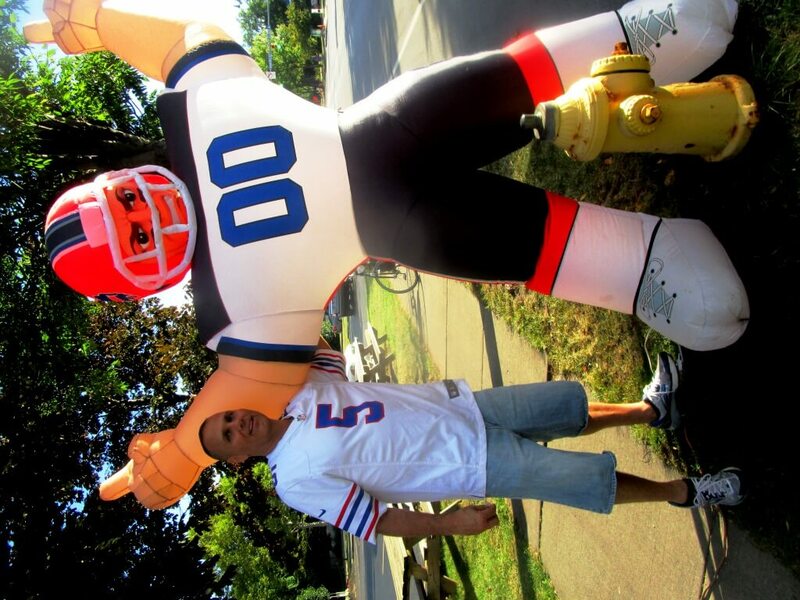 The lack of conversation about their absence is more a symptom of the general malaise in Bills Nation — still loyal as ever — after a 16 year playoff drought. Within the context of the long standing struggles of the team, the jilted Jills feel like a small piece of the picture. Somewhat like the years of Kodak’s struggles and decline. People didn’t pay much attention when Kodak stopped sponsoring softball teams or dropped Friday night badminton. So fans of a losing franchise don’t pay that much attention to the cheerleaders. But Gregg has hope. He thinks if the Bills become playoff contenders, you’ll hear more and more talk about wanting the Jills back. If the Bills reach the national spotlight in the playoffs, the Jills absence will become even more glaring. The way for the Jills to return is for the Bills to be great again. I would add that for the Bills to become playoff contenders they should add the Jills now. It can’t be quantified, but maybe the Bills and their fans are missing the energy, excitement and passion of the Jills. Maybe Cheerleaders — the 12th Women — can themselves positively impact a game’s outcome. 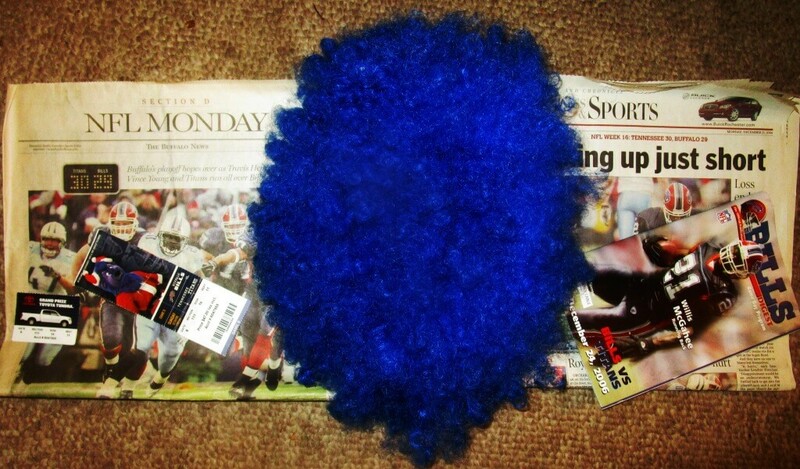 The other day I looked over memorabilia Dean and I brought back from the December 24th, 2006 game against the Titans: newspapers, tickets, program, and the blue wig Dean wore all game (JK). A frigid and snowy day, we heard you could get good scalpted tickets outside the stadium. We did and it was frigid; Dean recalls being cold for a week after. Eliminated from the playoffs, the Bills lost 30 – 29, as the sharp winds made a last second field goal unrealistic, instead failing on a J.P. Losman Hail Mary. The next day, the Buffalo News and the Democrat and Chronicle complained about the then-7 year drought. The papers compared the ’06 loss to ’04 when the Bills were eliminated from the playoffs by the second string of the Steelers. Ten years later, I don’t have an urge to drive to Orchard Park to watch another 8-8 team not even enlivened by Jills. Like others who have suffered for 16 years, we’ve re-discovered there is football all around us. In Brighton, there is new team is in town you won’t want to miss. On Elmwood Avenue, you can can enjoy football under the lights. Last Friday, I attended the McQuaid v. East game. Having friends at both schools, my outfit was designed diplomatically. The man who took the photo, Nico Mundy, also had divided loyalties. 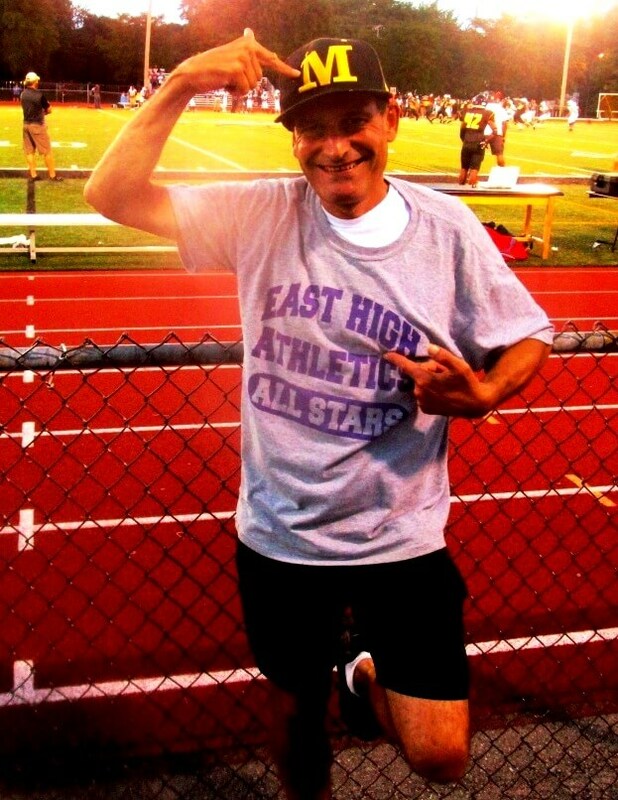 Nico’s nephew plays for McQuaid, but Nico himself played with Roland Williams at East in ’94. Nico said I could take off the shirt or the hat depending on who won. And further down the road at the University of Rochester watch the Yellowjackets play at refurbished Fauver Stadium. And my Brighton Barons are off to hot start at 2-0, including a 27-0 shut out. Last year, I met Austin Carr at a pre-game warmup session next the high school (I later saw Austin at Topps where he always greeted me cordially.) Last season was Austin’s second as the starting quarterback. A thoughtful and mature young men, Austin took his leadership role seriously, even reading some articles on sports psychology. As a veteran, during pre-game activities, Austin’s job was to make sure the younger players kept a calm focus. Austin noted that younger players don’t realize how short a season is — only 8 games — and each requires total mindfulness. As Austin is Asian-Amercan, I briefly asked what it felt like being the first Asian-American starting quarterback in Baron history. Austin said the milestone had pretty much gone unnoticed. 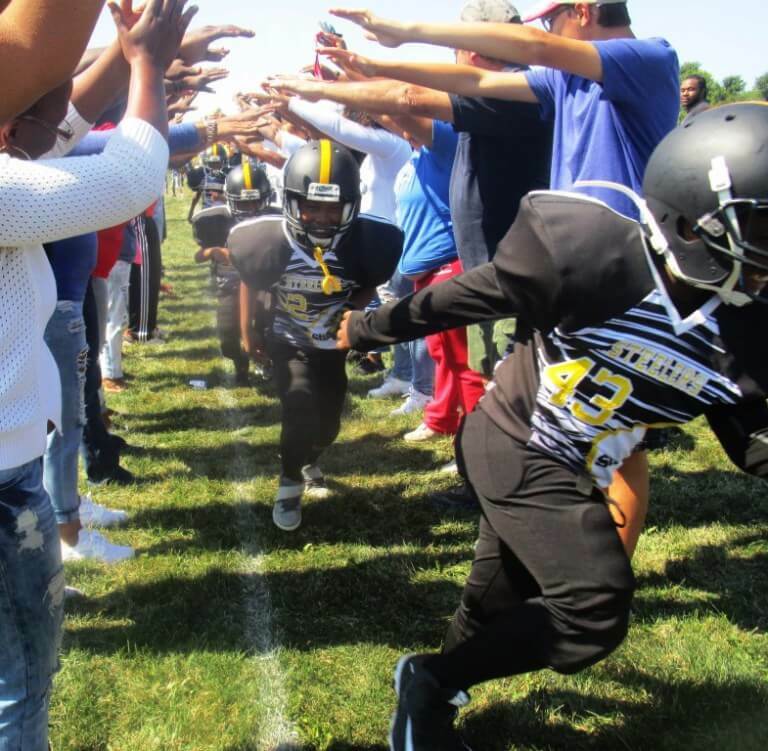 As he rightly noted, the Brighton football team is one of the most diverse in the county. Austin said being first was cool, but no big deal. 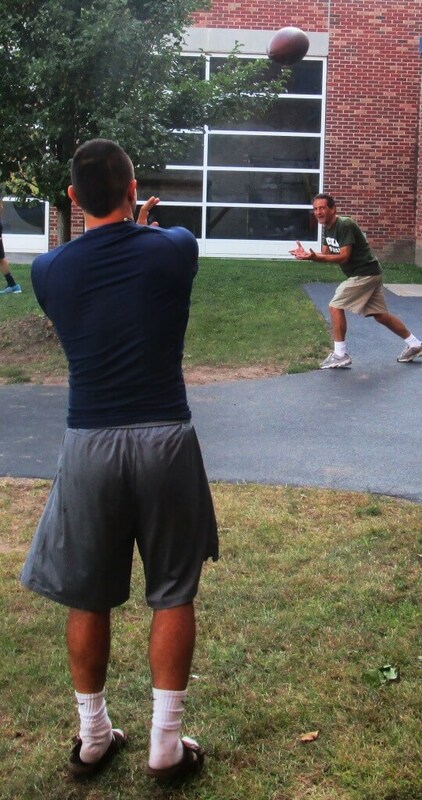 And, now on the football team at the University of Rochester, you can catch Austin in action at refurbished Fauver. Who needs pro football anyway? 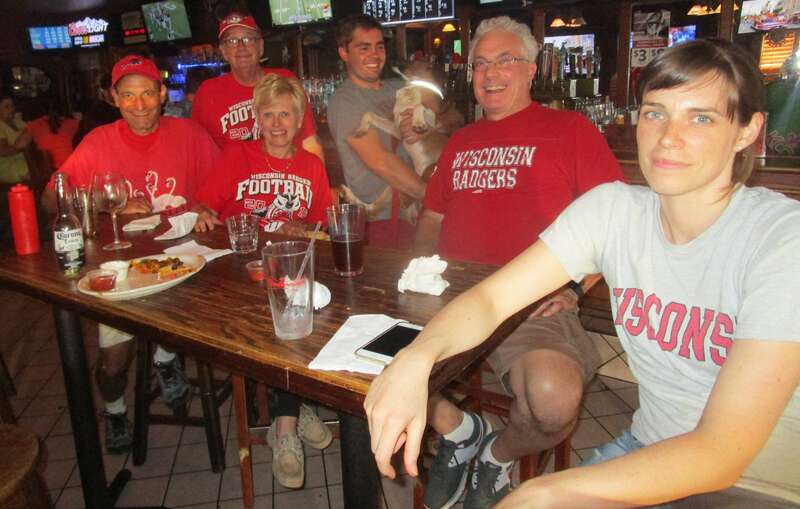 My University of Wisconsin alumni association gathers at the Otter on Saturdays to cheer the Badgers. Hooked since we watched the Badgers and Frank the Tank lose in the NCAA basketball finals, I was with a sea of red for the Badgers big opening game win played at Lambeau Field. 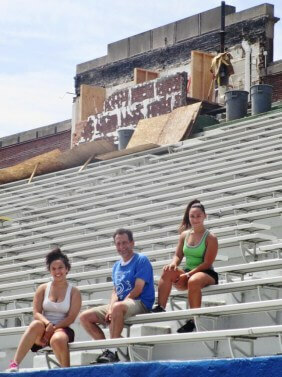 And with football back at Monroe, next year we’ll be treated to the electricity of urban Friday night football on Alexander Street — something not seen in over three decades. So, Bill — before it’s too late — get on your hands and knees and beg Jill to come back.